The Independent India: Wow there is no Problem of over-speeding in India !!! Wow there is no Problem of over-speeding in India !!! because there are no roads and wehicles can't run without roads. hear comes the new post about great Indian roads sorry not roads they are International highways. 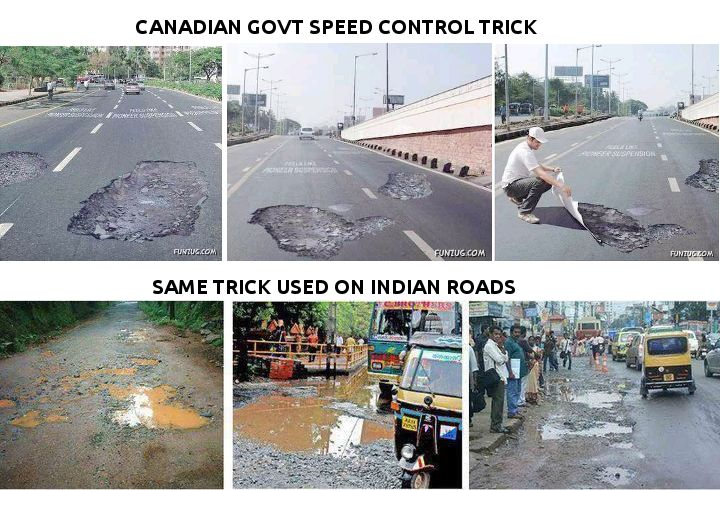 Many countries are facing the big problem of overspeeding on their highways, roads etc..
but they have found a trick to overcome this problem and the goo thing is that the problem is solved. As we say that 80/100 beimaan phir bhi mera desh mahaan. hamare ko koi solution nahi chahiye as the solution which the foreigh countries are using is being use form several years form India. Hear we go for the Image representing the above article..
fantastic yaar Indian sach main mahaan hain. yes bro there is no gurantee. rodes 1 saal main banti hain. India is ultra advance the thins which Canada have started now a days India is following from several years.